We’d love your help. Let us know what’s wrong with this preview of The Way It Is by William Stafford. To ask other readers questions about The Way It Is, please sign up. After nearly a decade of unjust war, torture, and human rights violations on the part of our government, I find myself exhausted of outrage and with little belief that any action of mine can cause any meaningful political change. At such a time, I come to William Stafford as to a refuge. Take, for example, "Something to Declare"
our path near that old river. the feel and lift of the time passed by. started its tilt into where it is now. They say that history is going on somewhere. one picture still for a long time and waited. which way to come if it wants to find me. This is the first book I have finished for My Two-Thirds Book Challenge. Sara picked this book up at the lovely Defunct Books in Iowa City. It is a nice used book store that sits atop The Red Avocado vegan restaurant. Two great places in such proximity! At 268 pages, there are a lot of poems in this book, which cover a 36-year publication history (1960-1996). It even includes the poem he wrote on the day he died. I quite enjoyed this book, copied out several poems and a handful or two of great line This is the first book I have finished for My Two-Thirds Book Challenge. I quite enjoyed this book, copied out several poems and a handful or two of great lines to use as prompts, read several to Sara, and generally pondered what Mr. William Stafford was like as a human being. The one possible drawback to these poems is that there are simply too many of them to digest at once. The reader can discern one or more minor shifts in Stafford's work across time* which makes it a bit more difficult to get a grasp on him at any specific time. But honestly, this is a very small thing as his shifts are never very large and have more to do with his moving across parts of the country and with the normal shifts in theme and voice that a poet encounters as they age. These poems accompany one as well as would a wise, world-observant, loquacious, and avuncular (but frequently solitary) companion who knows how to give one all the space and time one needs to grow just as wise and world-observant. He never gets in your way, never obstructs your view, doesn't tell you what to think or even what to observe. The Way It Is is not a prescription but a description, and it winds its way through the whole volume and not simply the single short poem that bears that title. In fact, lines and phrases quite similar to "the way it is" are peppered throughout the poems of this volume. Love, the land, family, community, death, aging, historical events, nature, academia, and writing are only some of the many topics of these hundreds of poems. In many ways I wish that I had taken a bit more time with these poems, that I had let them sink in more. Although, I am envisioning rereading them in the not-so-distant future as a one-poem-a-day meditation over the course of a year plus (there are approx. 400 poems). My version of a bible chapter a day, if you will. "The volume is organized as follows: recent poems in the first section; a second section selected from the six volumes collected by HarperCollins in Stories That Could Be True (1977); a third section of poems published by other publishers, mostly in limited editions; and a fourth section selected from the poet's last three HarperCollins volumes, A Glass Face in the Rain, An Oregon Message, and Passwords" (253). All arrangement issues aside, I truly enjoyed this book and look forward to revisiting it and more of William Stafford's work. I will leave you with an excerpt from "An Afternoon in the Stacks"
Another book I'll have on my "currently-reading" shelf forever. Poetry--you can't just dash through it and if it is good you have to read it more than once. I love lines like this: "A voice within my shadow wakened me". A friend whose reactions to the world I particularly admire posted a poem by William Stafford online recently; that was the first I'd heard of him. His collected poems mostly fall within a distinct emotional terrain - part stoic, part melancholy - and within it, they are wonderful. Stafford published his first book of poetry at age 48, and many of his poems focus on memories of his parents, aging and retirement, or how we live in the presence of transience and loss. His language is resolutely si A friend whose reactions to the world I particularly admire posted a poem by William Stafford online recently; that was the first I'd heard of him. His collected poems mostly fall within a distinct emotional terrain - part stoic, part melancholy - and within it, they are wonderful. Stafford published his first book of poetry at age 48, and many of his poems focus on memories of his parents, aging and retirement, or how we live in the presence of transience and loss. His language is resolutely simple, often warm; natural forces are profound and often generous. A few of the poems reflect Stafford's pacifism, but most pose moral rather than political questions. If a visitor may quiz a marble sentiment. Winter stops by for a visit each year. coming. They listen to some silent song. their wings and come gliding in. reach out. They touch and shiver. These nights are going to get cold. touches, wide spaces lying out in the open. I go back to stafford often. Someone says in the intoduction to 'The Way it is' that thre is a different stafford for everyone. I love all the staffords - the playful, the funny, the important, the popular, the moral, the angry, the meditative, the sad.. The collection truly conveys the scope and power of Stafford’s poetry. Many of the poems in this collection have been widely anthologized, but the book is a great to explore the many subtleties of Stafford’s writing. Stafford’s work is immediately accessible and devastatingly tremendous in its simplicity. These are among the most accessible poems I have ever found. I feel like some of them have been written just for me. I am happy to have discovered William Stafford finally...and wonder how I missed him before! This collection includes poems he wrote in the last year of his life, including the last day of his life. Lovely preface by Nye. I loved Stafford. His poetry delivers like drinking water: you don't realize how much you needed it until you've had your fill. I appreciate how short and yet substantial his works are; it starts to feel like beads on a necklace after a time, with each one different, and yet all of them speaking to the same big question. Stafford's writing while direct and plain is rich with observation and understanding of life. This is a book to return to again and again over the years, and I suspect find new meanings each time. Stafford's humility and love of nature shine in his writing. While they are different, as a fan of Mary Oliver I'd also recommend Stafford. This is the best introduction to Stafford, a great overview, and it includes a section entitled "There's a Thread You Follow," with a selection of 46 poems written the year of his death, sequenced according to date written. His practice was to write a one poem per day. His last poem, "Are you Mr. William Stafford? ", will break your heart. stafford is one of my favorite poets, this collection manages to give you his life's work, plus a whole slew of new things that'd he'd just started putting down on paper. it's hard to say which bunch i enjoyed more. "Right has a long and intricate name./ And the saying of it is a lonely thing." Just outstanding. Unpretentious, thoughtful, simple, excellent poetry. Along with Denise Levertov, W.H. Auden, Mary Oliver, Jane Kenyon, and Naomi Shihab Nye (one of Stafford's students), this collection of Stafford rocketed him into my poetic hall of fame. Too many good ones to quote. He's got such an odd, interesting and individual way of seeing the world. He continually astonishes me. There are a lot of reasons the fan base of this deceased poet keeps growing. For readers of William Stafford, it is the wisdom of his message, his clear, comprehensible prose, his quiet urgency and subtle, honest emotions. His magic lies in not trying to be anything other than who he is. He is often playful but more often serious. In a body of work this size, the themes become obvious. There is a calming presence coming up from the earth and down from the stars. In other words, it's everywhere - There are a lot of reasons the fan base of this deceased poet keeps growing. For readers of William Stafford, it is the wisdom of his message, his clear, comprehensible prose, his quiet urgency and subtle, honest emotions. His magic lies in not trying to be anything other than who he is. He is often playful but more often serious. In a body of work this size, the themes become obvious. There is a calming presence coming up from the earth and down from the stars. In other words, it's everywhere - if one is willing to do more than glance around. Our destruction of nature will come back to us someday. Time passes whether you like it or not. War is never a matter of fate. Fear is everywhere - and something to learn from. The unassuming, metaphorical nature of Stafford's writing means that these important, timeless messages have a better chance soak into one's psyche, slow and sure. "After Arguing against the Contention That Art Must Come from Discontent"
Whispering to each handhold, "I'll be back,"
"Made it again!" Oh how I love this climb! "Made it again! Made it again!" "After arguing" represents the best, most enduring trait of Stafford's work: the celebration of being alone and of making your own path in life. Stafford acknowledges loneliness, pays tribute to his parents and others who died in his lifetime, but again and again finds comfort in his own company. These wonderful works were culled from 3000 poems published by William Stafford, the late Poet Laureate of oregon, including the last poem written the morning of his death. Many of the titles refer to Oregon locations: "Malheur Dawn", "By a River in Osage Country", and "In Hurricane Canyon", "By the Deschutes Shore", "At the Klamath Berry Festival". In "Message from Space", the message is "Everything counts; the message is the world." 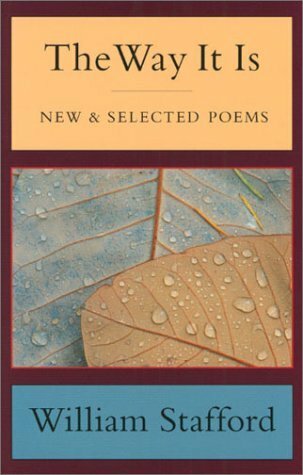 In "Trouble with Reading", we "discover ho These wonderful works were culled from 3000 poems published by William Stafford, the late Poet Laureate of oregon, including the last poem written the morning of his death. In "Trouble with Reading", we "discover how ink feels; You plunge; it holds you." I like the title of "Are you Mr. William Stafford? Yes, But ...". "Just be ready for what God sends" has "You can tell when strange things with meaning will happen." "Our city is Guarded by Rockets" displays "I think our story should not end, or go on in the dark with nobody listening." "How These Words Happened" gives us "I found these words and put them together by their appetites and respect for each other. It happens like magic to the words in the dark house where they sleep." Stafford's most famous and moving poems, "Ask Me" and Traveling Through the Dark", are included here. What a creative mind is on display here! The sky — the sky — the sky. It may be a mistake, if you're just beginning to read poetry for the first time when you are old, to start with a long book by just one poet. An anthology may be the way to go. If you're reading just one poet, soon the poems begin to sound a little bit all the same. You get glimpses of a life and a way of seeing and some of the words and images take hold of you. You think that perhaps his mother was not a happy person and that she bequeathed some of her melancholy to her son. William Stafford was a prolific poet, writing over 20,000 poems with over 3,000 actually published-- including one composed the day he died. That's a guy with something to say. Filled with a sense of calmness, wonder, and also melancholy, Stafford's poems may seem easy to skim through, but often reveal deeper truths when you circle back around. Profound, honest, and inspired by a life lived with attention and insight. I regret that I have only recently discovered the magnificent tenderness of this man's poetry. This book represents a pretty impressive and successful effort of dipping a tiny cup into an oceanic body of work produced almost every single day over the course of an entire lifetime and coming up with a collection that does a fantastic job of presenting a deep and engaging portrait. For any of my friends who are poetry fans, I cannot recommend this enough. Lovely work, that shows Staffords forte of making the simple and everyday things vibrate. Not consistently stellar... some lapses in imagery like "Here came a horse, clippety-clop, away" (Learners) but some deceptively simple while illuminating, like Fixers "I've bullied rusty iron and made it remember what to do...."
Definitely worth the time to read. Makes me want to see what his son has done. Some of William Stafford's poetry in this book is enjoyable and some is so inscrutable that I wondered how it got published and why he is so lauded as a poet. He is the great influencer of one of my most favorite poets, Naomi Shihab Nye, so I expected to love his poetry as much as hers, but I see little relationship between their poems. I still love Nye far more than Stafford. I think the best way to learn poetry is to take the a poem written by Stafford and knowing what he knows and what you know that may or may not be what he knows..... then with your mind like that, ,,,,, writer. I never read enough Stafford, and decided to do something about it. One of my fave volumes, the fellow Oregon transplant's simple but deep, image-rich language stirs me, soothes me, and always helps me look at the world differently. One of the great discoveries of my life was William Stafford. I went to school for a few years in Astoria, OR, and was introduced to this amazing poet. He isn't very well known outside of Oregon, but he should be! His work is brilliant and profound.